Overview - Before Psycho, Peeping Tom, and Repulsion, there was Diabolique. This thriller from Henri?Georges Clouzot (Le corbeau, The Wages of Fear), which shocked audiences in Europe and the U.S., is the story of two women—the fragile wife and the willful mistress of a sadistic school headmaster—who hatch a daring revenge plot. With its unprecedented narrative twists and unforgettably scary images, Diabolique is a heart-grabbing benchmark in horror filmmaking, featuring outstanding performances by Simone Signoret (Casque d’or, Army of Shadows), Vera Clouzot (The Wages of Fear), and Paul Meurisse (Le deuxième souffle, Army of Shadows). The use of suspense in film has become old hat in recent years. Most contemporary thrillers tend to lean on tried and true methods and regurgitated flashy techniques which overwhelm the audience with an imposing level of manipulation that stifles any actual engagement on their part. Through quick cuts, flashy filters, and hand holding musical scores, many suspense and horror films often take the easy way out with a basic formula of success that makes for a passive and unoriginal experience. This isn't always the case however, and there are times when thrillers rely on less obtrusive methods, where subtlety and specific but clever emphasis give visual developments room to breathe. Skilled directors seek to guide, not force, the audience into anxiety ridden, active participation with the images flashing before them. We've all been there, glued to our seats, slightly on edge, sweat dripping from our palms, ready to jump at any moment, desperately wanting to leap into the screen to share valuable information with the clueless characters, all the while totally and completely engaged in not just the story but the actual images themselves. Alfred Hitchcock, often referred to as "The Master of Suspense," was a genius and pioneer of such methods, but there is another name that is every bit as synonymous and important to the evolution of nail biting thrills in cinema, and that name is Henri-Georges Clouzot. The acclaimed French director was responsible for several notable films, including his 1953 classic 'The Wages of Fear' but perhaps none are as revered or cherished as his 1955 masterpiece of suspense 'Diabolique'. The story follows two women, Christina (Véra Clouzot) the wife of a cruel and abusive headmaster at a boarding school, and the headmaster's mistress, Nicole (Simone Signoret). Tired of their mutual lover's brutal treatment toward them, the two conspire to go through with the unthinkable and hatch an elaborate and seemingly fool proof plan to murder him. From here the women lure their unsuspecting victim away from the school, attempt to sedate him, and then… well, I won't be a devil and spoil the rest, but suffice to say, what follows is an expertly crafted, meticulously written, and beautifully performed descent into paranoia, guilt, anxiety, and of course, suspense. What makes 'Diabolique' so effective, beyond the great performances by Véra Clouzot and Simone Signoret, is the incredible direction. Henri-Georges Clouzot brings an almost effortless style to the proceedings, presenting the heightened plot in an often matter of fact form, one that holds subtle and deliberate subjectivity just below the surface. The film is full of careful but never gaudy compositions, meaningful blocking, and very calculated camera movements and cuts. The scene where Christina first welcomes the evil headmaster into her trap is full of these wonderful but never imposing techniques. When he first arrives and greets her, Christina is full of uncertainty. She guides him to a bedroom where the sedative has been placed in an otherwise harmless bottle of liquor, and before entering, she momentarily lingers by the doorway, briefly cast in shadow. This fleeting but important moment is a wonderful visual touch that enhances the internal subtext of the scene through imagery and acts as a foreboding precursor of things to come. Once in the actual room, the suspense ramps up. Christina tells her cruel husband that she is leaving him and he angrily refuses to accept it. All the while, sitting on the table between them as they fight, is the bottle laced with sedative. It simply sits there, naturally, as a mere prop in the scene, like any other, occasionally slipping in and out of view as the camera moves or cuts to new angles. Clouzot doesn't go out of his way to highlight it. There are no close-ups or dramatic zooms. It's just there, acting as an informal menace, wryly reminding the audience, not in a demanding shout, but in an almost subliminal and casual whisper, "Is he going to notice it? Is he going to pour a glass? When will he pour a glass?" We know it's going to happen, but the build up to it is where all the excitement lies, and Clouzot presents it in a stripped down but still artfully potent manner that allows the audience some level of control. At one point, the headmaster starts to plead his case. He tries to convince Christina that things were never as bad as she has made them out to be, and reassures her that their relationship can still be mended. It's at this point that the camera reframes and suddenly the ominous bottle is no longer in the shot. The threat is quite literally gone. Christina's demeanor wavers and it appears she might relent and back out of her plan. Just when it seems she's lost her nerve, the headmaster quickly reaches out of frame and with a simple camera movement, the bottle is not only back in view but is soon being poured into a glass and then raised to… well again, I won't be a devil. What's truly remarkable about the form of the filmmaking on display here is the economy of it all. Clouzot is able to develop such anxiety and suspense with so little. He knows better than to rely on flashy tricks or more importantly an overbearing score. Like the vast majority of the movie, this sequence is completely without music. The simple reality of the scene, that simple lingering bottle, bolstered by a few subjective but not imposing flourishes is more than enough to create the desired effect. There is truth enough in the inherent drama of the scene, and while it would be easy to overdo things with stylistic excess, Clouzot practices a type of honed in, precision level restraint. The rest of the movie expands upon similar techniques and is filled with equally and even more masterful examples, including a few particularly nail biting sequences involving a pool and a suspenseful, thematically rich reveal featuring an opening door and a mirror. While free of music, Clouzot still uses sound to great effect and it's possible that after seeing this movie one won't be able to hear a running faucet or draining tub quite the same ever again. The climax of the film is also worthy of much praise, and while I won't go into too much detail, it features one of the female characters running through a dark and shadowy house, terrified and in fear for her life. If that sounds familiar to you, well it should. It has become a staple of all horror thrillers and while perhaps not the first time such a scene has appeared on screen it is still more or less the template from which all subsequent imitators have been molded. While there is no denying the film's place as a cinematic milestone, there are still some very minor issues with the story. The final reveal, which I of course won't go into detail about, is wonderfully handled, but when put up to scrutiny, certain machinations by certain characters do seem a bit overly elaborate and unrealistically intricate. Still, this really is just minor nitpicking and while a bit strained, the plot does hold up logistically. 'Diabolique' is truly a masterpiece. It is that rare kind of film that molds plot and form into a whole far greater than their individual parts. Its influence is still felt today (and even led to several incredibly unnecessary remakes) and will continue to be felt as long as directors attempt to make our hairs stick up on end. This is a treasure of a suspense movie, essential viewing for any film fan. And if you've already seen it, please, as the ending title card politely asks, don't be a devil and ruin its wonderful surprises for those who have yet to have that great pleasure. 'Diabolique' is provided in a black and white 1080p/AVC transfer in the 1.33:1 aspect ratio. Criterion has done a respectful job here, but limitations in the source material do hinder the overall visual presentation. The print source is in very good shape and looks to have been restored and cleaned up nicely. There are a few specks and faint vertical lines here and there, but overall it's rather pristine. A natural layer of grain is also preserved throughout. The main issue with the video is an overall softness prevalent in the picture. This is almost certainly just a result of how the movie was shot, but the picture can appear quite fuzzy at times, and a few shots actually look somewhat out of focus. Still, even with the inherent softness, there is some nice detail in a lot of scenes and even some strong dimensionality here and there, especially in the shadowy climax. Contrast is good but has a slightly subdued quality that lacks a bit of the pop that some other black and white releases have. Black levels are great though, delivering a nice, inky tone. Overall, 'Diabolique' looks about as good as it can on Blu-ray and even though a lot of the picture has an innate softness to it, the nicely restored video presents this great film with the respect it deserves. Provided with an Uncompressed Linear PCM French Mono track with English subtitle options, 'Diabolique' sounds good. Dialogue is clean but a little thin and the track is free of any inconsistencies or signs of age and seems to have been cleaned up well. Naturally there is no real directionality or bass to speak of and dynamic range is fairly flat. However, balance between dialogue and effects is good. Overall, 'Diabolique' sounds exactly as it should and this mono track does a good job of preserving the fantastic use of sound in the film. The fact that so much can be evoked from just a single channel of audio is another testament to the skills of the filmmakers involved. Criterion has provided a decent assortment of supplements, including a selected-scene commentary, some interviews, and a trailer. All extras are provided in 1080p in Dolby Digital Mono. A booklet featuring an essay by film critic Terrence Rafferty is also included in the package. Video Introduction by Serge Bromberg (HD, 15 min) - Bromberg provides some nice background on Clouzot's previous filmography leading up to 'Diabolique' and touches upon topics that include the director's style, his demanding relationship with his actors (including his actual wife Véra Clouzot), and his attention to detail. Bromberg also provides some interesting analysis of certain elements of the film. Selected-Scene Audio Commentary - French-film scholar Kelley Conway provides selected commentary on a few scenes. The scenes are separated into three chapters labeled Setup, Additional Clues, and The Finale, and are viewable separately or together. Conway comes across as extremely knowledgeable but speaks in a very formal manner and appears to be reading from a prepared essay. The commentary offers some interesting academic analysis of the scenes provided while also giving a few bits of trivia and details on Clouzot's life. Definitely worth a listen. Video Interview with Kim Newman (HD, 16 min) - Novelist and film critic Kim Newman is interviewed here on topics dealing with the film's twisting story and structure and its notable influence on subsequent thrillers. Though some information is repeated from the previous features, it still offers some worthy insight. 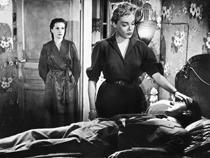 Henri-Georges Clouzot's 'Diabolique' is a brilliant film that essentially defines suspense on screen. Its unimposing but effortlessly artistic images, editing, and sound design avoid the overly manipulative tropes of contemporary cinema and form a thrilling road map toward excitement that an audience must actively follow in order to be rewarded. The video and audio presentations are respectable and the supplements are insightful but a bit sparse. Essentially, on the strength of the film alone, this is a more than worthy addition to any serious film fan's collection.